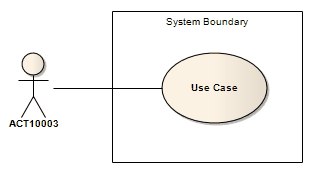 A System Boundary element is a non-UML element used to define conceptual boundaries. You can use System Boundaries to help group logically related elements (from a visual perspective, not as part of the UML model). By associating the System Boundary - and not the Use Case - with the classifier, the classifier is linked to the Use Case as a user, but not as an owner. You can also define a Use Case as the classifier of a System Boundary element, to link the elements enclosed in the System Boundary (such as parts of an Activity diagram) to their representation in a logical Use Case. The element properties for a System Boundary element comprise the name, the border style, and the number of horizontal or vertical swim lanes. You can also change the overall shape of the System Boundary. A System Boundary element can be marked as 'Selectable', using the element's context menu. When the element is not selectable, you can click on the other elements within the System Boundary space without activating or selecting the System Boundary itself. If a subject (or system boundary) is displayed, the Use Case ellipse is visually located inside the system boundary rectangle. Note that this does not necessarily mean that the subject classifier owns the contained Use Cases, but merely that the Use Case applies to that classifier.